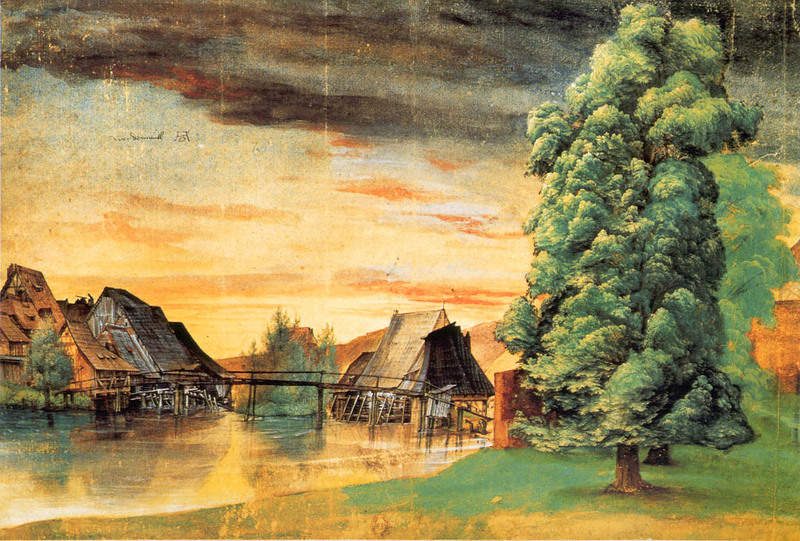 Albrecht Dürer, The Willow Mill, 1498 or after 1506, watercolour, bodycolour, pen and ink on paper, 25.3 x 36.7 cm. Bibliothèque Nationale, Dept des Estampes et de la Photographie, Paris (WikiArt). This watercolour landscape would not look out of place alongside the works of Turner and other masters 300 years later. It is one of many pioneering works by the versatile genius of the Northern Renaissance, Albrecht Dürer. A landscape at dusk (or dawn). In the middle distance, spanning the view from the left edge to the mid-right, a series of buildings, spindly footbridge, and structures associated with a mill straddle a calm river or lake. The water passes from the left foreground to the centre distance, reflecting the buildings and some small vegetation within them. On the left are tall trees in full leaf on the grassy bankside, one in the foreground with its foliage lit, another almost hidden behind it. In the far distance hills glow in the light. Dark clouds cover the uppermost section of sky, below which are scattered clouds white and tinted orange in the light. Compositionally, the bright, sun-stained sky, water and buildings form a wedge, from almost the entire height of the left edge, to a narrower band in the middle of the right edge, across which the tall trees mark a cross-piece. The location has been identified as the north bank of the River Pegnitz, where it flows past the Hallerwiese Park outside the city walls of Nuremberg (Wolf). Born in Nuremberg, Germany, on 21 May 1471, Dürer’s father (Albrecht Dürer the Elder) was a successful master goldsmith, and his godfather was the most successful publisher in the country. Dürer the Younger entered into his apprenticeship as a goldsmith in 1486, by which time he was already prolific in drawing (especially in metalpoint) and painting. On completing his apprenticeship in 1490, he spent four years extending his skills, travelling to Colmar, Strasbourg, and Basel. He married on his return to Nuremberg in 1494, but they remained childless. 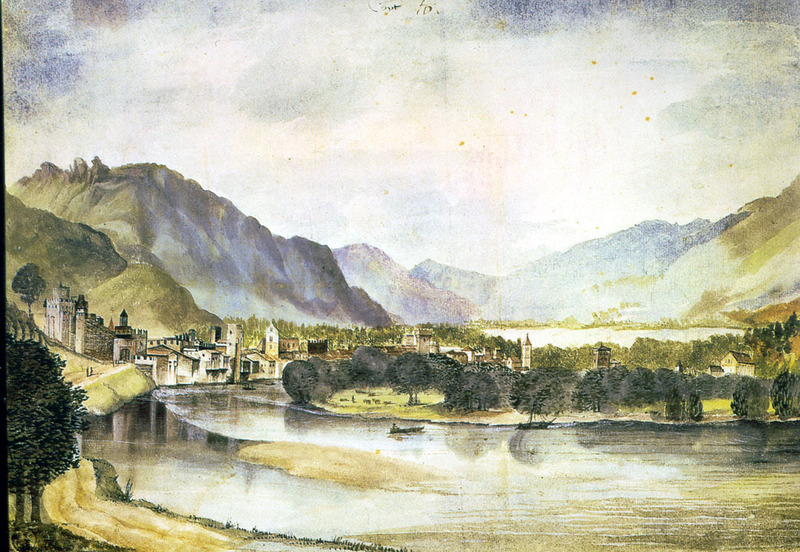 Albrecht Dürer, View of Trento, 1494-5, watercolour and bodycolour on paper, 23.8 x 35.6 cm. Kunsthalle, Bremen; currently held by the Russian Federation, Moscow (WikiArt). Three months after his wedding he left to travel to Italy, and probably reached Venice, drawing and painting watercolours of his travels through the Alps. He returned to Nuremberg the following year, and opened his workshop, producing many fine woodcuts as well as various drawings and paintings. Around 1500 he produced several sets of woodcuts which amounted to early comics, although large numbers of individual prints were also sold. He additionally started to produce engravings, with considerable success in the years after 1500. Albrecht Dürer, View of Nuremberg, 1497, watercolour and bodycolour on paper, 16.3 x 34.4 cm. Kunsthalle, Bremen (WikiArt). He returned to Venice from early 1506 for just over a year, where he completed a commissioned altar-piece for the expatriate German community’s San Bartolomeo church. On his return to Germany he painted a series of major works, including his famous Adam and Eve (1507), and many more woodcuts. In 1520, increasingly feeling the effects of age on his sight and dexterity, he travelled to Antwerp and the Netherlands, meeting the pioneer of landscape painting Joachim Patinir and several other major artists. Declining health from 1521 saw him writing more, particularly on geometry, perspective, and the physiognomy of people and horses, which formed major printed works. He died, allegedly from malaria contracted towards the end of his trip to the Netherlands, in Nuremberg on 6 April 1528, a rich man from his labours. probably the greatest visual artist from Germany. 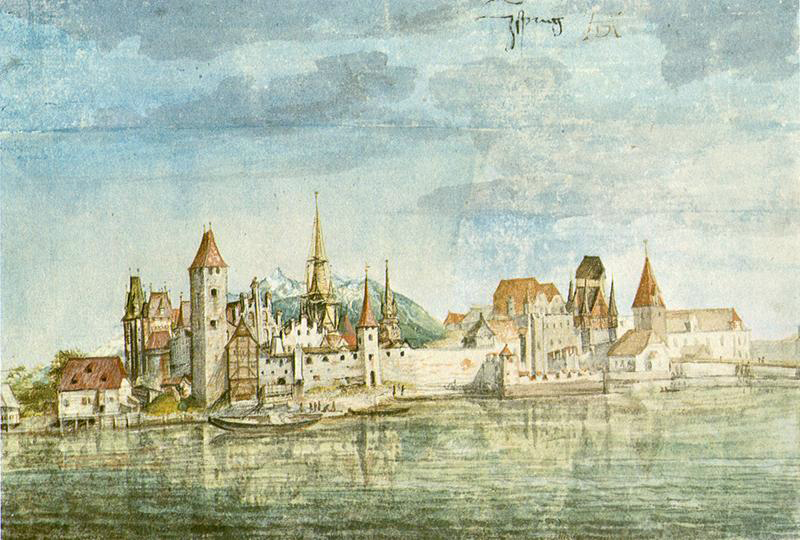 Albrecht Dürer, View of Innsbruck, c 1495, watercolour on paper, 12.7 x 18.7 cm. Albertina, Vienna (WikiArt). At this time, travel even over relatively short distances was hazardous and slow. During his three major trips abroad he added to his bank of images not just drawings but finished watercolour paintings, something that did not become usual until the nineteenth century, reaching its zenith perhaps with the Alpine and Venetian journeys of John Singer Sargent at the end of that century. He set the pattern for Turner and many other artists of the future. Although it is tempting to suggest that he painted his watercolours plein air (outdoors), others have argued that this is most unlikely in the circumstances. Looking at them now, I would suspect that he drew the scenes plein air, and probably applied some watercolour washes to provide colour cues. Then when indoors he probably worked the paintings up to completion using further watercolour, pen and ink. 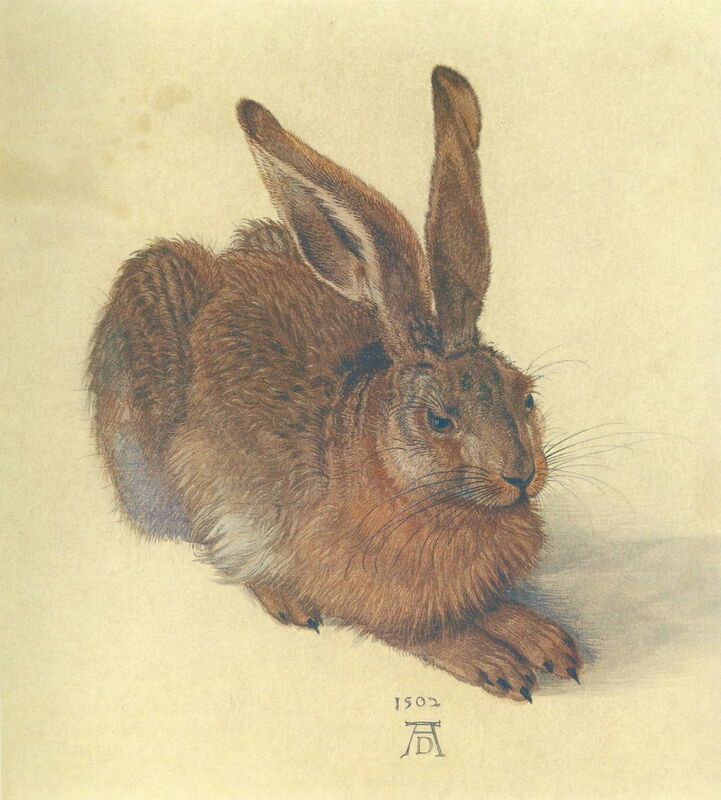 Albrecht Dürer, Hare, 1502, watercolour and bodycolour on paper, 25 x 22.5 cm. Albertina, Vienna (WikiArt). At this time, the great majority of paintings had religious subjects, or were portraits. Landscape painting would not really exist as a genre for more than a century, as a result of the much more formal paintings of Poussin and Claude. Dürer used watercolours to open up other new genres, with his exquisite rendering of the fur of a hare, one of his most famous images, and several innovative botanical paintings. 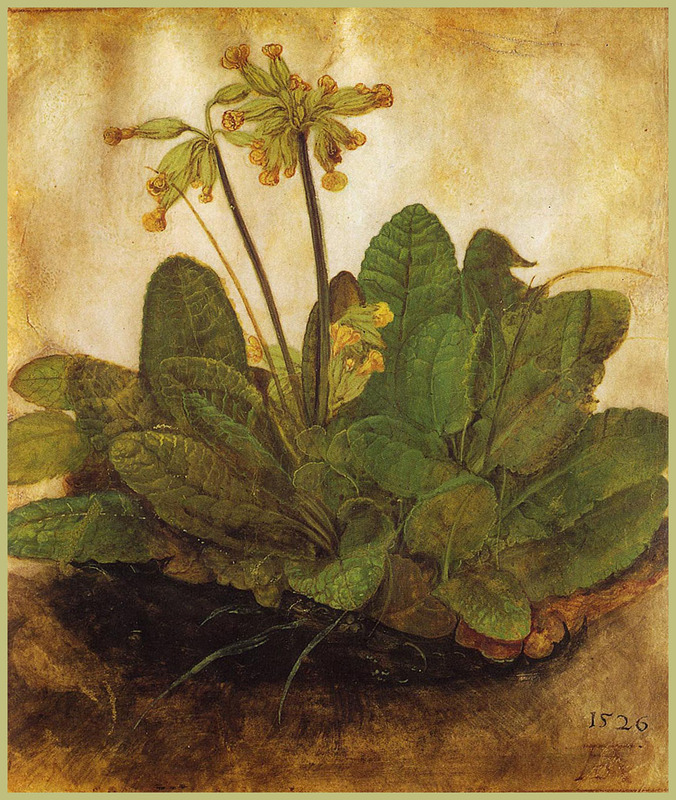 Albrecht Dürer, Primula, 1526, watercolour on paper, 19 x 17 cm. National Gallery of Art, Washington DC (WikiArt). Dürer is sadly out of fashion at present, with a shortage of good published collections of his works, few exhibitions, and most of his watercolours hidden away from the public eye. As they are mostly on paper (some apparently on vellum), they tend to be in collections which do not exhibit as much: for instance in the UK the best collection is in the British Museum, not the National Gallery. 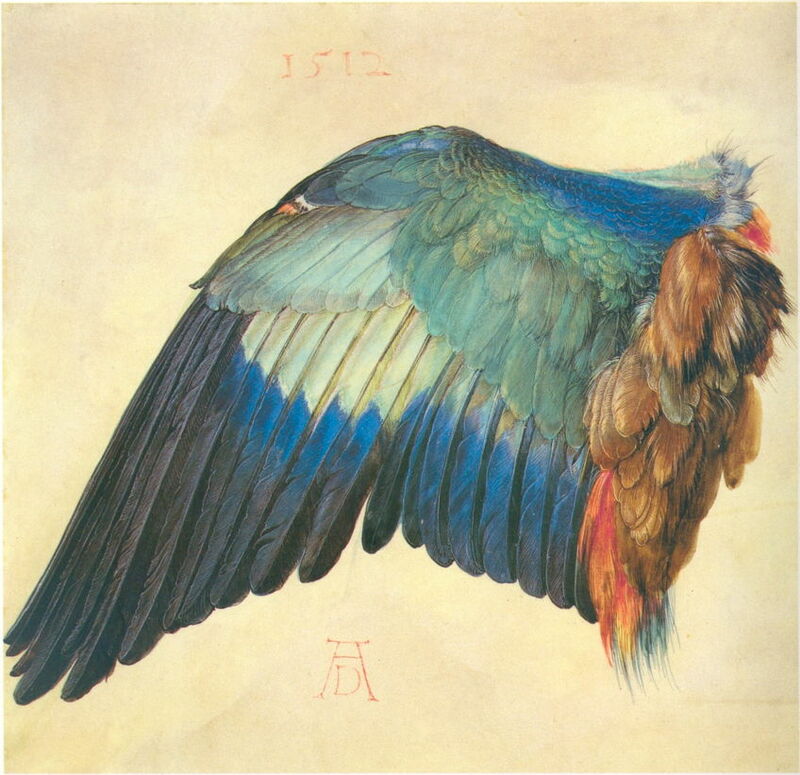 Albrecht Dürer, Wing of a Blue Roller, 1500 or 1512, watercolour and bodycolour on vellum, 19.6 x 20 cm. Albertina, Vienna (WikiArt). This is a great shame, as his watercolours compare very favourably with those of the great masters of the medium from Cotman, Turner, and Girtin onwards, and he showed himself to have strength in landscapes, wildlife, architectural, and botanical subjects — a remarkable versatility for an artist of any era. He was fortunate in many ways, living at a time when the printing press was spreading rapidly through Europe, which resulted in the production of much more paper, and the development of specialist papers which would absorb water-based media appropriately for printing and painting. Curiously, he was also probably the first artist to undertake legal action to stem widespread plagiarism: in 1512, a council decree upheld his rights against forged prints of his work which were not only losing him income, but which were affecting his reputation because of their poor quality. Although he clearly recognised his own talents, his innovations in prints, watercolour, and broadening painting genres make him a true genius, and this remarkable painting a signpost to the future. Posted in Painting and tagged Dürer, landscape, plein air, watercolour. Bookmark the permalink. I have just added three more, and much better, books to the list of references above. Sorry for adding them late, but they have only just arrived. i have 2 books and 1 sketch done in charcoal but looks to be maybe from a book originally. 1 of books is in german and published in 1928 with big cover of MR Albrect Durer name spelled out and initals logo he used . Anyone with info or appraisal help too much appreciated. The print above before mentioned is ” The Mill of Nuremberg” Albrect Durer (1490).